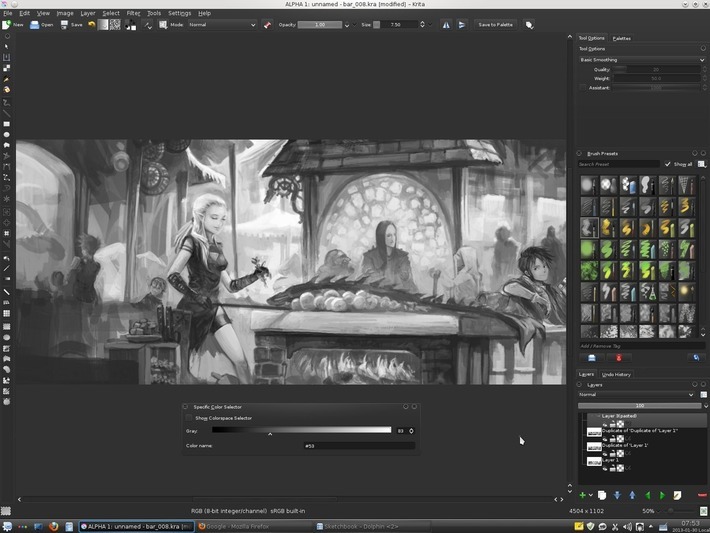 - To dim down all the polluting back-light of your display around artwork and help you to focus on your artwork, a good idea to change Krita for a darker theme. Top menu : Setting > Theme > ...then choose. ex : here I have my trusty 'Black-White_1200x1600' workspace ready to launch for my screen. License: CC-BY David Revoy, www.davidrevoy.com, 2 february 2013 . I am not sold on the darker color-space, I mean in what case will the artwork be shown in a dark environment? Probably only if you are working on a movie or a video game. I'm preparing a Krita quick reference with all shortcuts, for printing and folding to put on your desk. I'll post it on the forums soon and maybe you can spread it around. Hm... Reading this, I'm wondering whether a 5% increment for the light/dark shortcuts wouldn't be nicer. @MrBeast : Also , I think I prefer darker UI for Krita since I'm working on the Cintiq ; the short distance of the screen and my eyes... I think I want to limit lightness and contrast all around the canvas to keep focused. @Yuri Fidélis : Oh cool ! Sure, I'll spread it. Just checking your website today. It seems your RSS link is not working. @Sanjay Maurya : Oh, thanks for the notification. I would love to fix that. What RSS agregator do you use ? ( I may need it to see if I can reproduce ) . Here I can access the infos here : http://www.davidrevoy.com/feed/ . @@susandevy : Hi Susan , oh yes ; Krita development is high-speed , and the development of 2.8 started a little month ago while 2.7 is still not 'ready' to be packaged . I think recent Linux distribution ship with 2.6 . 2.5 is a nice version and I used it on the production of "Tears of Steel" but a lot of performance improvement were done on 2.6 . Are you using Ubuntu 12.04 ? Becarefull with last qt4****** updates , Ubuntu developpers broke all KDE apps during last week , they should have fixed it , btw ; but a lot of report were reported on forum and bugtracker about it. It affected Gnome based system ( Xubuntu/ Unity / Gnome ) ; no issue with Openbox and KDE desktop management. Great post. this kind of information could be really expensive. We are learning a lot of things from you.